I am from Mauritius, I finished my high school education in 2012 and I decided to come and live in Switzerland. My brother works in the hospitality industry and he has an interesting job. So I thought “Why not work in the hotel business in Switzerland” ? I am currently training to become a governess at Les Diablerets at the Hôtel Les Sources. With this training, I was looking for an apprenticeship and I found it at Starling Hotel Lausanne. I really appreciate my work here because the work team is competent and very welcoming. My manager gives her time to support me and make me progress, which is very appreciable. We have loyal customers who come back often, which creates a friendly atmosphere. Then, the hotel business is a stimulating market that I like with a strong international outlook, which also allows the regular practice of languages. What is a typical receptionist day? 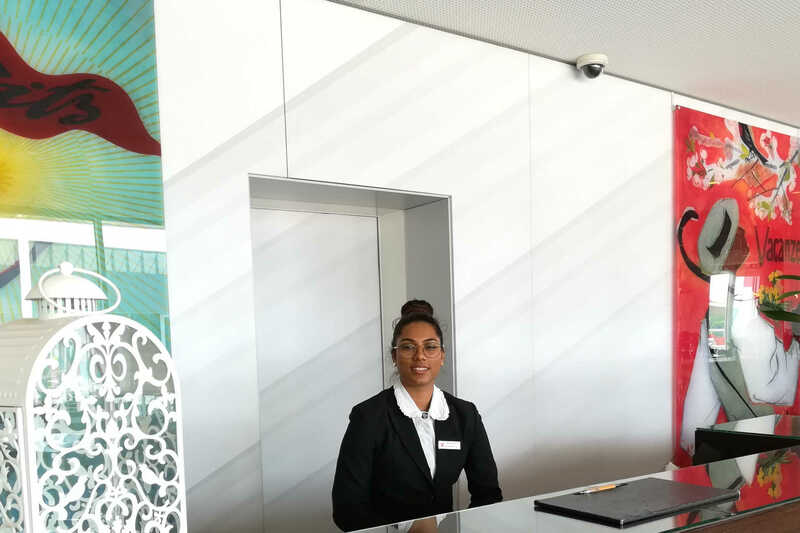 First of all the reception of the customer: doing the check in and check out, informing the client on the functioning of the hotel, the activities to do in the city. We often have a lot of check in and check out at the same time, which represents a lot of time in our day. Then, we also have administrative tasks like email management, booking, information to deliver to house keeping, etc..
What makes you a competent receptionist? I smile and listen to the customer. My listening skills enable me to anticipate customer needs and be proactive. In addition, I am well organized and quite multi-skilled. I can both handle, for example, check in/check out and answer the phone at the same time. I am comfortable with foreign languages, which is essential for the reception. I think you have to have great mental strength and know how to manage stress and rush periods like check in and check out, for example. It happens regularly that we have many arrivals or departures at the same time, it is necessary to know how to remain calm and smiling and to receive each customer with attention and listening but nevertheless with speed and effectiveness. Then I would also add that it is a team effort: if my colleague is stressed, it will affect my work and the clients. On the contrary, if each of us remain professional and focused, it is ok. It should not be forgotten that we are, as receptionists, the first contact with the customer and the first impression that the customer has is the most important. So if his welcome goes bad, it’s already bad for his stay. Finally, I take care of my presentation: hair tied, elegant and discreet make-up, adapted dress code. What advice could you give to people who want to become receptionists? All the elements I have just shared with you in the previous question are essential. Then love what you do, it’s not an easy job, there’s a big mental load to bear so you have to keep pace and be dynamic! Why not continue in the Starling group, this could be a good opportunity for me and would means that I gave satisfaction during my apprenticeship. Working at house keeping as a housekeeper would please me or continue to evolve at the reception. I’m also thinking in the long term of training myself to become event coordinator in the hotel business, it could interest me a lot. “I would say”: magnificent setting, modernity and warm atmosphere.